So you have recently purchased the OnePlus 5T and are now looking for ways to make your indulgence a little more productive, fret not we have got you covered. Today in this tutorial we will tell you essential tips and tricks to master your OnePlus 5T and turn it from the best to a beast. OnePlus’ as we know runs on Oxygen OS, a customised version of Android, which is quite close to stock Android, yet has a few tricks up its sleeves. So here is an exhaustive list of things you can do with your new beast. You can long press on your finger print sensor when in the camera app to quickly click a picture, to enable this you have to navigate to Settings > Gestures > toggle the switch that says “Long press to take a photo” and you will now be able to click images by long pressing your finger print sensor. Just like the previous function, you can enable swiping on the fingerprint sensor to bring down the notification panel by which you can easily see your notifications and change your quick settings. To enable this go to Settings > Gestures > toggle the switch that says “Swipe fingerprint for notifications”. The OnePlus 5T unlike the OnePlus 5 does not have a front facing fingerprint scanner which may be a problem for some people but you can enable double tap to wake feature on your device which can help you check your notifications quickly without moving your device. This can be found in Settings > Gestures. Again from the gestures, you can enable 3 finger screenshot which when enabled will allow you to quickly take a screenshot by swiping 3 fingers together from the top of the screen to the bottom. This is helpful in a variety of situations including ones where your buttons aren’t easily accessible because of your case! Most of us use our devices to read and more often than not that leads to headaches and loss of sleep due to over exposure to blue light. But with the help of special reader modes reading becomes considerably better. To enable reading mode on your OnePlus 5T go to Settings > Display > Reading Mode and enable it. You can also set it to get enabled automatically when certain apps are opened. Most people now tend to have 2 numbers on their phones now, one for business and one for personal use. These 2 numbers present a dilemma, what number to use the instant messaging apps on? Well, OnePlus 5T solves this problem with clone apps which allow the user to use multiple copies of a single app so you can have 2 Whatsapp numbers running simultaneously. To enable this feature go to settings > Apps > parallel apps and enable the apps you require. Similar to the notification slider offered by Apple devices, OnePlus too has implemented the slider on their OnePlus 5T and you can customise it to your liking. To customise it, go to Settings > Alert slider and from here you can make adjustments to the options to make the device more personal. Now that you have set up the 3 finger screenshot gesture you can make better use of it with the help of extended screenshots. To click an extended screenshot click a screenshot with the usual button combo or by sliding the 3 fingers across, when a screenshot is clicked a rectangle icon will appear at the bottom of the screen, just click on that and expand it to the point you want a screenshot of and you will have an extended screenshot. The OnePlus 5T has a display with 18:9 aspect ratio which can lead to pillar boxing of the videos you’re watching but you can make the videos full screen by either double tapping on the screen or by trying a pinch out gesture, now the gesture will depend on the app you are using so you can try a few different common gestures too. Android by default comes with only battery icon and no percentage is shown but it can be enabled from the settings by going to Settings > Status bar. By going to Settings > Status bar > Battery style, you can customise your battery icon to display the amount of battery information you would like. Unarguably OnePlus 5T has a very fast face unlock option which works well 8 times out of 10 but you don’t want your phone to unlock when you just want to glance at your notification, so you can enable a lock screen where even when the phone has recognised your face won’t open until you swipe up. This will save you from accidental unlocks leaving your phone vulnerable. You can enable this extra lock screen by going into Settings > Security & lock screen > Face unlock, and toggling the switch for the Auto unlock after the screen is on option. Most apps don’t support the 18:9 aspect ratio yet but most modern phones are now shipping with displays that are 18:9, so OnePlus has an option to scale the apps to the display size so there is no letterboxing of the content. To enable this Go to Settings > Apps > Full-screen apps and change the ratio. Some apps may cause some problem so by going into the same setting you can bring them back to regular settings too. OnePlus ships with a pretty accurate and good looking panel but if you are still unhappy with its performance you can change it to your liking by going into Settings > Display > Screen Calibration and choosing what suits you the best. 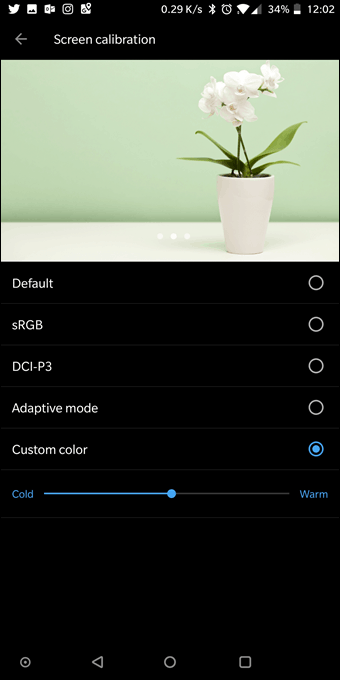 OnePlus offers a set of 6 LED colours you can choose from if you are bored of the usual red LED, you can head to Settings > LED notification and change the settings for different functions in there. The on-screen buttons on your phone don’t need to be boring single-function buttons; you can customise them and assign them up to 3 actions each to do different versatile things. To enable this go to Settings > Buttons and tap on the Long press or Double tap option and customise them to your liking. This won’t be applicable to everyone out there but for those who just can’t stand those software buttons can hide them with just one touch and when you need them you can just swipe up from the bottom to bring them back. To enable this Settings > Buttons > Hide the navigation bar. OnePlus 5T offers a night mode built in which can help you get a good night sleep by reducing the amount of blue light emitted by the device, you can either toggle it manually or can set it to be activated automatically at a scheduled time or on sunrise-sundown. To enable this go to Settings > Display and tap Night Mode, then select “Turn on automatically”. OnePlus 5T comes with the back button placed to the left and the recent button placed to the right of the home button which is in the centre but you can change this by going to Settings > Buttons > and toggling the “Swap buttons” option. If you have some naughty things on your phone which you don’t want other people to see you can simply move them to secure box from the file manager, this will remove them from every other app and prevent it from showing in any other app and you can then confidently show off your new OnePlus 5T to your friends and family. Most phones don’t offer app locks built into the system but OnePlus 5T isn’t one of those, you can lock apps with a pin, a pattern or your fingerprint so only you can open and access them. To enable this go to Settings > Security & Lock Screen > App lock and enable the lock on the apps you want locked. So here was our exhaustive list of things you can do with your new OnePlus 5T if you found this handy guide helpful don’t forget to leave us a comment and do tell us what you would like us to cover next.